I have been making lip scrub since around the age of ten out of brown sugar and olive oil, and while this does a perfectly fine job of exfoliating, sometimes you need a cute pink jar. 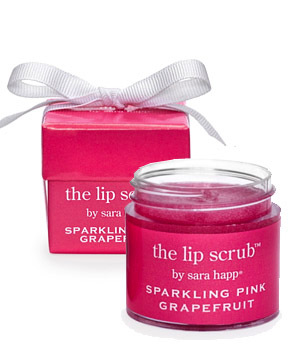 I came across lip-scrub-extraordinaire Sara Happ while browsing a fashion magazine and immediately had to lurk her online. Sara's line of lip products can be found in over 400 luxury boutiques worldwide and all products come in a white ribbon wrapped truffle box. Fabulous.